Sometimes people say, "I am just a reader," as though this were a petty or insignificant ministry. However, when the reader (whether tonsured or not) begins chanting the selection from the Acts or the Epistles, he or she is performing an evangelical ministry that is absolutely essential to the celebration of the Divine Liturgy, and as such it demands the same care and preparation as any other liturgical ministry. When the day of Pentecost had come, they were all together in one place. And suddenly a sound came from heaven like the rush of a mighty wind, and it filled all the house where they were sitting. And there appeared to them tongues as of fire, distributed and resting on each one of them. And they were all filled with the Holy Spirit and began to speak in other tongues, as the Spirit gave them utterance. Now there were dwelling in Jerusalem Jews, devout men from every nation under heaven. And at this sound the multitude came together, and they were bewildered, because each one heard them speaking in his own language. And they were amazed and wondered, saying, ‘Are not all these who are speaking Galileans? And how is it that we hear, each of us in his own native language? Parthians and Medes and Elamites and residents of Mesopotamia, Judea and Cappadocia, Pontus and Asia, Phrygia and Pamphylia, Egypt and the parts of Libya belonging to Cyrene, and visitors from Rome, both Jews and proselytes, Cretans and Arabians, we hear them telling in our own tongues the mighty works of God’ (2:1–11, RSV). Once the reader has studied the text and obtained some sense of what it says, the next step of preparation is developing a strategy for chanting the text. In common church parlance, we say that the reader “reads” the epistle, yet what we actually do in the Liturgy is profoundly different from, for example, reading a child a bedtime story. In most traditions, the scriptural text is intoned recto tono with an occasional one- or two-step variation. Put another way, the scriptural text is sung to a very simple melody that stays on the same note most of the time, and occasionally rises or falls one or two full steps. The complexity of this chant can vary considerably, with some liturgical traditions employing highly melodic chant melodies and cadences. It is often asserted, even in some written instructions to church readers, that the reason the Scripture readings are chanted (as opposed to being read in a speaking voice) is so that the reader does not have the opportunity to impose distracting inflections on the scriptural text. While there is a degree of truth to this assertion, the tradition of chanting or singing liturgical texts (prayers, Scripture, or composed texts) also addresses a far more practical concern: the transmission of the human voice. Quite simply, it is much easier for a solo voice to be audible through the chanting or singing of a text than through reading it in a spoken voice. Anyone who has ever lectured or done much public speaking knows that it is far more taxing on the human voice to speak loudly than it is to sing at a comparable or greater volume. And anyone who has ever served in a Divine Liturgy in an outdoor venue (such as a pavilion set up for a large gathering) with little or no electrical amplification knows that even the best speaking voice would simply never be heard. Chanting the scriptural text helps allow the words of the text to be heard by all those assembled. Sentences have their own rhythm as well. For example, in the first sentence of the reading for Pentecost (Acts 2:1), the text has the following accents: “When the day of Pentecost had come, they were all together in one place.” One final, though no less important, type of rhythm is narrative or rhetorical rhythm. When a story is told, there is at least one climax (narrative climax); or in an argument, there is at least one moment when a conclusion is made based on the preceding arguments (rhetorical climax). Whatever chant pattern is used, all three types of linguistic rhythm should be rendered so that the text is as intelligible as possible and the beauty of the language is preserved. There is, within the Slavic tradition, a chant melody that starts on a very low pitch and ascends step-wise, concluding at a very high pitch with a simple cadence. This melody is exactly the same for every reading, regardless of length. It is highly dramatic, especially when the reader or deacon possesses a large vocal range. This has been referred to as the “up from the grave” style of chanting. There is an inherent problem with this melody in that it is almost guaranteed to distort the natural rhythm of the text. The melody “assumes” that every scriptural reading has its narrative or rhetorical climax at the very end, and this is simply not the case. Often the narrative climax of a given text will fall towards the middle, as it does in the reading for Pentecost. In the text quoted above from Romans, there is one rhetorical emphasis in the middle, and at least two others fall in the latter half. Clearly, these two texts require chant melodies that allow for enough freedom to respect the multiple forms of rhythm inherent in the text. Some might argue that the aim of the church reader is to chant with as little accent or rhythm as possible, and certainly any style of reading that imposes a distracting or distorting rhythm on the text should be avoided. However, people do not talk like machines, and anyone who has ever heard computer-generated speech knows how unnatural it sounds. It sounds unnatural precisely because the computers are not smart enough to capture the highly nuanced rhythm of human language. Thus, the task of the church reader is to chant the scriptural text in a manner that conveys the full range of meaning through the human medium of language. With these guidelines in mind, even the most experienced reader should always read through the text at least once prior to the service, in an audible voice, practicing the reading. The beginner would be wise to chant the text in front of another person prior to the service and ask for criticism. The reader might even want to make marks in the text so that he or she can easily recall the various accents when reading in the Liturgy. Successfully chanting a scriptural text always includes a final cadence. Exactly how this cadence is performed will vary depending on the tradition; however, the cadence is essential to inform the hearers that the reading has concluded. A common mistake is to omit the cadence, so that the reading seems to run into a wall and come to a dead stop. This is often followed by a few tense moments of dead silence, as no one is sure whether the reading has really ended. Another difficulty arises when there are two or more readings prescribed for the day. If this is the case, the reader should wait until the end of the last reading to chant the final cadence, to avoid any ambiguity about the conclusion of the readings. The cadence can be as simple as a change in tempo (ritardando), or it can also include a unique melodic component; but however it is performed, it should always be an unmistakable indication that the reading has ended. A final element of rhythm is speed. Almost every beginning church reader will be tempted to read too quickly. To a beginner, it can seem as though a reading is taking forever. Standing in the middle of the church as the focus of attention causes most new readers to be nervous; the natural, unconscious reaction is to speed up so as to get the unpleasant experience over with. Simply reading aloud is something new to most people, and most will read far more quickly than is necessary. Thus, if it feels as though the reading is going too slow, the pace is probably about right. The reader should take his time and allow himself and the gathered assembly to appreciate what is being read. Though many of the texts we read in church become familiar to us over time, the reader should always assume that at least one person in church is hearing the text for the first time, and therefore the proper pronunciation of every word is essential. Once a reader understands the reading and is prepared to read it in a manner that brings out the organic rhythm of the language, the task remains to execute the reading with precision. This is primarily a matter of proper diction. Consonants are the major component of diction in church reading; if the reader ensures that all the consonants are in place, the vowels will normally follow. The reader should pay particular attention to words that end with consonants. Words like “Lord” or “and” can end up sounding like “Lor” or “an.” While these mispronunciations may not entirely obscure the meaning of the text, they diminish the overall clarity of the reading, which compromises both beauty and intelligibility. Clear diction is particularly important when reading in a church that is quite large or that has particularly poor acoustics. (“Storefront” churches with sound-absorbing ceiling tiles are particularly notorious for rendering mute even the best of readers.) The clear and precise pronunciation of consonants will produce a crisp and highly audible reading. The reader should also remember that proper diction requires a good deal of mouth movement: one cannot properly pronounce words with a lazy mouth. A good practice technique is to imagine that you are trying to talk to someone through a soundproof window. The only way to do this is to exaggerate the normal movements we make when speaking. While this certainly could be taken to an inappropriate extreme, the good reader will always take particular care to open the mouth and fully pronounce every consonant. So, while always respecting the natural rhythm and accent of the text, the reader should strive to articulate every consonant of every word. Toward this end, he or she should employ all of the methods employed by singers: proper breathing, posture, and tone production are all necessary for accurate diction. With those vital elements in place, the reader is likely to achieve a high degree of clarity. Readers should always be aware of the space in which they are reading, and the degree to which the space is acoustically “alive” or “dead,” as the case may be. A number of variables affect how loud a reading needs to be, and these can even change from day to day depending on the number of people attending the service, or the number of small children making their own joyful (or not-so-joyful) noises unto the Lord. For example, a large church building with good acoustics might require less sound than a small storefront church with sound-absorbing ceiling tiles, filled to capacity at the Paschal Vigil. If the reader is too quiet, people will not be able to hear; if he or she is too loud, the volume can be distracting. A reader also must know the proper range in which he or she can chant. Generally, male readers will tend to read at a lower pitch than necessary; if they choose a slightly higher pitch, they will have better tone production. Female readers, on the other hand, often read on a pitch that is too high. This phenomenon has to do with overtones and the particular resonance of the church building. A reading by a soprano who employs all the best singing techniques but chants on a very high pitch can be almost incomprehensible. Should this be the case, the reader can simply choose a slightly lower pitch in which to read. Beginning readers in some Orthodox traditions are often flustered when they are unable to match the pitch of the deacon or priest during the introductory dialogue (“Wisdom”; “The reading . . .”; “Let us attend!”). However, the most important thing is for the reader to chant in the range that is best for his or her voice. Though it requires greater skill and experience, the reader should also try to choose a pitch that is within the same key the priest or deacon has chosen. However, it should always be remembered that a reader needs to use the pitch that is correct for the reader. If a reader begins a reading and realizes that the pitch is either too high or too low, the reader should pause and move to a better pitch. It is not inappropriate to change pitch after beginning the reading, and there are few things more agonizing than listening to a reader growl or screech through a reading simply because he or she is unwilling to stop and find the right pitch. 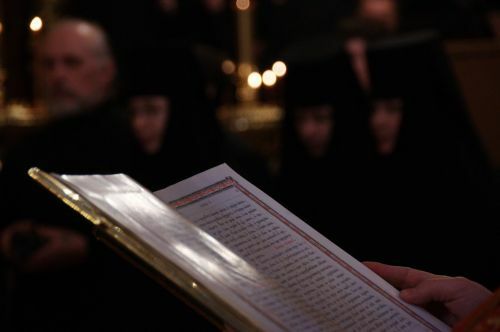 In some Orthodox traditions, prior to and immediately following the scriptural reading, the reader chants selected psalm verses responsorially with the singers. Without going into too much detail about this particular sort of singing, there are a few practical points for both the reader and the choir director to keep in mind. First of all, these two elements of the Liturgy are best understood as a short dialogue between the reader and the singers or congregation. The reader should be aware of what musical setting the singers are using so that the chanted verses do not wreak tonal havoc with the responses. A common method is for the reader to chant the verses on a comfortable note within the key of the response melody. A beautiful yet technically demanding solution is for the reader to chant the verses in the same melody that the singers use, a form that is perhaps most in line with the ancient practice of responsorial singing. Also, the choir director should be attentive to the pacing between the reader and the singers so that the two groups produce one rhythmically coherent chant. Admittedly, there are numerous technical aspects that facilitate effective responsorial singing, but the simplest solution to any problems that may arise is for the singers to practice with the reader. This is particularly important for beginning readers, those who have had little experience performing the solo component of responsorial singing. If a new reader has the opportunity to practice chanting the prokeimenon and the alleluia verses in a nonthreatening situation such as a choir rehearsal, he or she will acquire the additional confidence that comes with every sort of practice. Before uttering a single word, in some Orthodox traditions the reader makes a procession to the front of the church and sometimes passes through the sanctuary to receive a blessing from the presiding priest or bishop. Few readers consider this a procession, but it is no less so than the movement of the deacon from the sanctuary to the middle of the church (in Slavic practice) to read the Gospel. Thus, the reader should move with purpose, perhaps with the book held high in the same way that a deacon or priest carries the Gospel book in a procession. In some practices, the book is open to the reading at the time the celebrant gives the blessing; in this case the reader moves with the book still open to the reading. In either case, the book is held respectfully and the movement is purposeful. Furthermore, the book used by the reader should itself be as beautiful as possible. This is not to say that it must have a jeweled metal cover; however, it should not have colored sticky notes hanging out of its pages like a New England maple tree in October. Nor should the book have a broken spine or torn cover. Just like the book of Gospels that is kept on the altar, the book used by the reader should reflect in its physical state the importance of the text it contains. Ideally, it should be the properly appointed Apostol book. The final note in this overview of church reading must necessarily be on the importance of feedback and practice. No one is born a church reader; church readers are selected, trained, and often tonsured. If they are to perform their ministry to the glory of God, they will practice and seek out constructive criticism from those who hear them read. “Was I loud enough; could you understand the text; was I chanting on a pitch that is good for my voice; did I read too quickly; what did I look like when I walked up for the blessing; did I chant the prokeimenon verses on a good note?” The beginning reader should ask questions like these of the priest, the choir director, and even a few members of the community in order to make progress and read more proficiently. Even the experienced reader is wise to ask these questions occasionally, just to make sure that he or she has not unconsciously fallen into any bad habits over the years. To conclude this overview of church reading, it must be clearly stated that it is only an overview. Every facet of good liturgical singing is relevant to good church reading, and as every good liturgical musician knows, it is a lifelong discipline. As soon as one becomes complacent with his or her performance, it is likely that the performance is suffering. But if we are vigilant in performing the vital liturgical ministry of church reading, by God’s help, we shall proclaim the Good News of Jesus Christ to the glory of God.